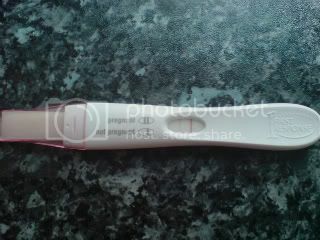 I held off from testing til this morning and wasn't expecting it to come to anything but I got a BFP!!!! Looks like the lucky list has struck again! I wanted to wait til hubby got home from work but couldn't hold it in so phoned him and gave him the news by telling him he's going to be a dad! He was really happy but kept telling me not to get too excited, that it was still very early days and we'll do some more tests in the next few days just to be sure. It sounds like he's being horrible but he's not, he just wants to protect me and doesn't want me to get too upset if it ends up in disappointment. I think he'll get more excited as time goes on. Just preying for a sticky bean! The picture makes the line look fainter than it actually is! I had to leave my bowl of cereal I was too excited to eat it lol! It doesn't feel real, don't suppose it will until later on. I meant to say! This month we used OPK's, BD'd every other day, I lay with a couple of pillows under my bum for about 20 mins afterwards and used my mooncup overnight so nothing escaped!! Thank you ladies, everyone is so lovely on here!! My EDD is 28th October, we were going to have a massive halloween party this year but guess thats not going to happen now lol! I have to say, the BFPs from people who I've seen post a little more always give me the biggest smile I'm so pleased for you. Congratulations! See you over in Due in October!